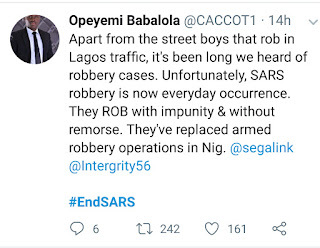 Over the past few months, there has been public outcry against a unit of the Nigerian Police known as the “Special Anti – Robbery Squad (SARS)”. 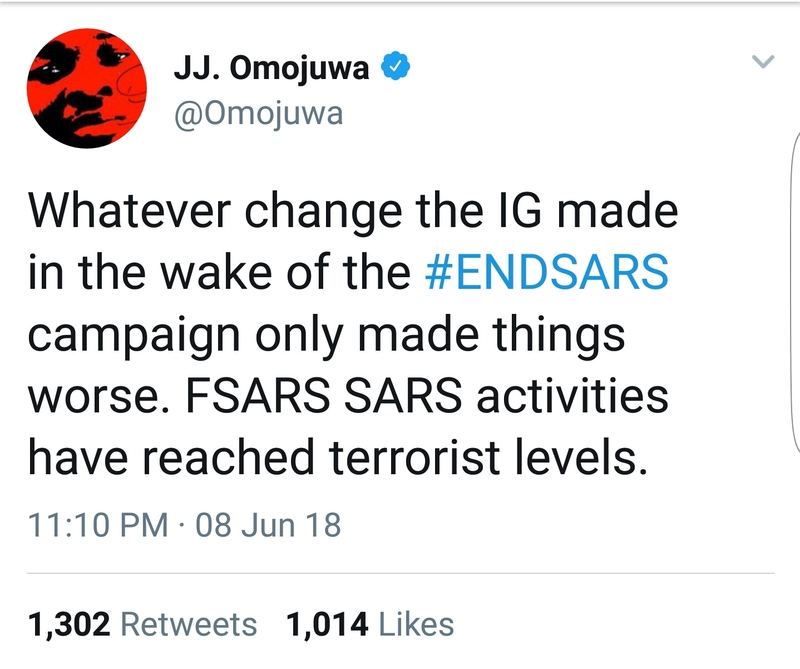 With the hashtag #EndSars, many Nigerians have called for the disbandment of the rogue unit within the police or in the alternative its complete reform. Albeit, despite the national outcry of the atrocities committed by these police officers, there seems to be no end to their reign of terror, extortion and blackmail as on the contrary, they seem to have been emboldened in their actions and social media is filled with daily reports of the inhuman treatment metered to Nigerian citizens by these gun wielding extortionist. 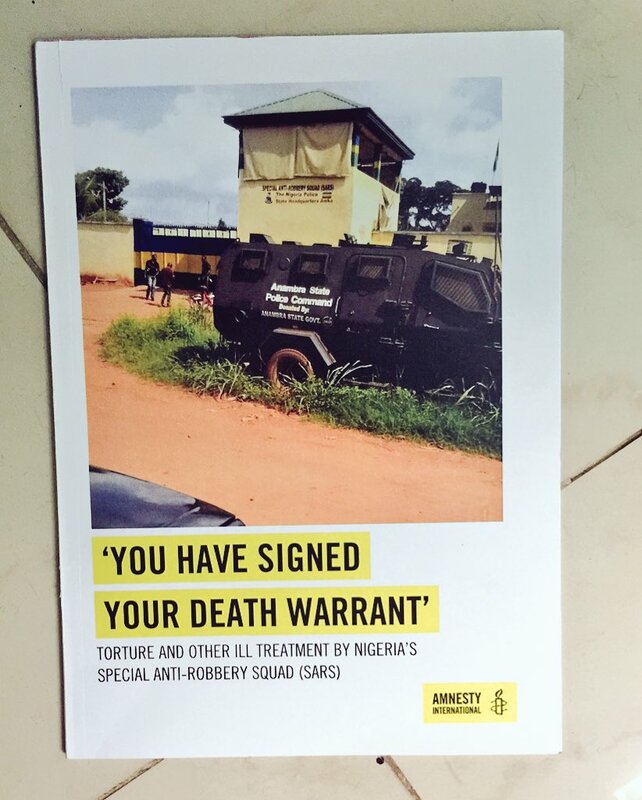 According to Amnesty International, in its 2016 report on SARS, titled; Nigeria: You have signed your death warrant, former detainees told Amnesty International they had been subjected to horrific torture methods, including hanging, starvation, beatings, shootings and mock executions, at the hands of corrupt officers from the feared Special Anti-Robbery Squad (SARS). 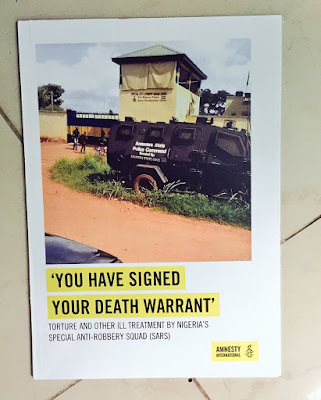 “Our research has uncovered a pattern of ruthless human rights violations where victims are arrested and tortured until they either make a ‘confession’ or pay officers a bribe to be released.”Amnesty International has received reports from lawyers, human rights defenders and journalists and collected testimonies stating that some police officers in SARS regularly demand bribes, steal and extort money from criminal suspects and their families. 'SARS officers are getting rich through their brutality. In Nigeria, it seems that torture is a lucrative business,” said Damian Ugwu. You may ask yourself if justice would ever inhibit this land? Or if we have a government? And you will not be wrong to let your heart fall to the feeling of despair and frustration resulting from the discovery that in a nation like ours, one must not look to the government to provide adequate security, rather one must secure oneself with a high fence and tough vicious dogs. But how do you protect yourself from the person who is constitutionally vested with the authority to protect you? how can we be assured that our cries would lead to the reforms we so desperately seek in the Police force. Is SARS ever going to change? The answer is “NO” and below are the reasons why our cries have not changed anything till now. The issue of police welfare has been on the burner for many years and is a factor critically responsible for the unlawful actions of the police. The Nigerian police is underfunded and underequipped and most officers have been forced to use extortion as a means of acquiring extra financial support for themselves and their families. In essence the need for better welfare packages for officers of the police force is of supreme importance. Another is recruitment, there are an estimated 350,000 police officers in Nigeria with a mandate to police a population of over 180 Million people. Which leaves an average of 500 citizens to one police officer. However, about 150,000 of these officers are assigned to VIP protection units. Leaving a little over 250,000 police officers to cater to the country. The issues of poor remuneration and gear also raise their ugly heads. Every officer should have a bulletproof vest as a standard part of his uniform but we find our officers are sent into duty with minimum forms of body protection or armour. The Police have stated that it would take an average budget of 1 Trillion Naira yearly for the Agency to leave up to its mandate, however with the current estimates of the Nigerian budget, the police alone would not be able to come close to such an amount in funding. A solution may however appear in the creation of State Police, an initiative the Nigerian Police has usually approached with caution due to the opportunity it would provide for State Governors to control the said state police for political gain, however, this must not be the reason why Nigerians should be denied the opportunity to give the creation of state police a try. Since the current Nigerian police will not be equipped to police the nation effectively within all territorial lines and also because community policing is now a globally accepted standard. The system of the Nigerian police is one that supports extortion and as long as the system is not reformed, nothing will come of our cries. According to Wikipedia, there are over 1300 police stations in Nigeria. Have you ever wondered how these stations are funded? The DPO of a police station is expected to run the station and usually this requires some finances. Does the Police Headquarters provide these finance? NO. It can then be assumed that Police Stations are meant to fund themselves and since the police does not have any business, how are they supposed to carry out their functions? You guess is as good as mine, they support the stations through funds they get from the public and how do they get those funds? you may answer that question to the best of your knowledge. Moreso, like the branch of a business, it has been alleged severally that each police station also has to forward financial returns up the chain, this therefore allows the police to run like a profit making company and when there are no goods to sell, how do they make profit? On social media and on other forms of traditional media, the Police Complaints commission has requested citizens who are unlawfully treated by Police officers to make official complaints and reports, however, the police complaints commission is not well equipped to come to the aid of every Nigerian and there have been queries of unanswered and untreated complaints. According to the Police Complaints website, in the first quarter of 2017, over 498 complaints were received by the unit, about over 355 were resolved and closed, while over 65 were false/unrelated. This number represents only a limited number of the acts of unlawful treatment that happen daily and it would be interesting to see recent numbers of complaint form the unit. From reports, the acts of extortion are openly done at the police stations and is no secret between the officers. They all know are deemed to know what is going on but are all unwilling to put an end to it because it serves their purpose. It can be likened to the system of a racket that is inbuilt into the system and as long as there is no mechanism to check these human right violations at the police stations, there would be no reprieve to the common Nigerian as the Police Complaints Unit cannot effectively cover all 1300 police stations within the country. Truth is usually, the DPO of every station and every other officer in the station is usually informed of the on-goings at the station and therefore it has become part and parcel of the system. The hard truth is that in Nigeria, the political class are most concerned about themselves and not the general populace. And it is only when it concerns them directly that they seem to seem to swing to action. For instance, in Nigeria courts, trials could take years to complete but election petitions are the only proceedings that have a maximum timeline of 180 days. This timeline was put in the law by politicians who were concerned about the security of their positions but they have not thought well to introduce time limits to other court proceedings because they believe it does not concern them as hardly do they fall victims of these unholy acts of the police. 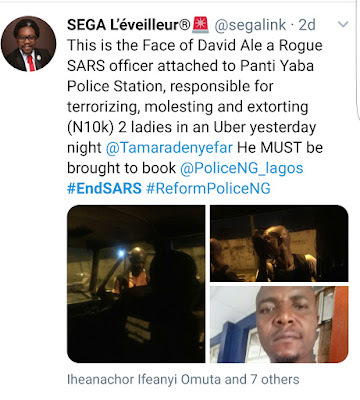 When a citizen is beaten and unlawfully arrested by SARS what are the instant remedies available to such a person. Obviously one cannot make a call as your phones are seized and crying for help is fruitless as one is usually beaten in the premises of the police station while other officers turn a blind eye. Such citizen is then asked to bail oneself after the police officers must have gone through the phone with the aim of discovering the person’s account balance before they are then allegedly lead to the bank ATMs to make cash withdrawals. The only remedy available to such person upon arrest is usually to be taken to court to prove his innocence of the crime but that includes being charged to court, being remanded by the Magistrate while bail is granted or denied and the requirement of having to instruct a lawyer to defend one’s case in court. Usually these only work in theory because most Nigerians rather than go before a judge who has now become as hardened as the wooding bench would rather pay their way out to secure their freedom. Until the law says that all police officers who collect bribes or act unlawfully will be removed from the force, then no form of reforms will come to the police. When there is no repercussion for the acts of extortion by the police it emboldens the officers to continue in the unjust ways. One may ask Yomi Shogunle how many officers have been dismissed after being found guilty of these acts, more often they are given lesser penalties like a demotion or a transfer to another unit, however, they are usually retained in the force to continue their acts of bitterness towards citizens and only a few are either prosecuted or jailed. 1. 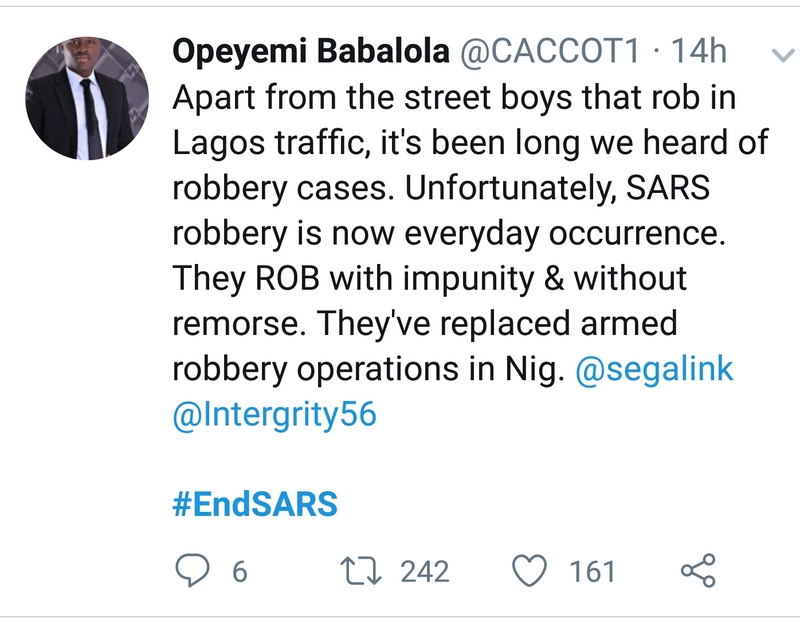 By making police and especially SARS reforms a KPI for the current political administration. The only time to get the attention of Nigerian politicians is in an election year and as we move towards the 2019 elections, the current APC government should be made to note that if they do not reform the police or disband SARS then there would be no re-election for them. Trust me, this will work. 2. By every Nigerian standing up to challenge unlawful SARS officials anywhere they may be found. 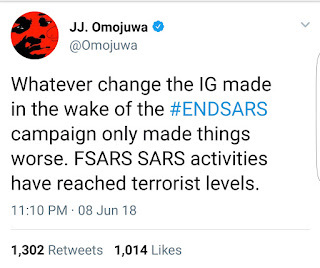 If you see a SARS official around you, make a recording of all their actions and put same out on social media, let them know that they are being watched everywhere the go and the people will hold them accountable. 3. Sue the police. The more people are able to enforce their legal rights and obtain judgment against the police for the unlawful acts they commit, the more government attention will be brought to these despicable acts. The above may not be exhaustive in providing solutions to the acts of human right violations by the police, if you have any way by which we can promote and achieve police reforms, pls provide same in the comment section below and to end in the famous words of Senator Dino Melaye “If you speak the truth, you die. If you lie, you die. I, Dino Melaye has decided to speak the truth and die”.